After a late night of finishing packing, Wanda and I both woke up be 6:30 AM and started getting ready to leave. We woke our daughter Courtney up around 8 AM, since she was dropping us off at Hobby airport. We got to the airport around 9:30; checked in and was through security by 9:45 for a departure of 11:10 AM from Houston Hobby Airport. We grabbed breakfast at the Wendy’s there before going to the gate. The plane actually left the gate 5 minutes early and made it to Tampa, for our connecting flight, 20 minutes ahead of schedule. Since there is a Starbucks in the terminal Southwest airlines uses in Tampa, we decided to grab a couple of drinks while waiting for our 3:30 departure. As we lined up to board the plane, we both noticed the large number of people pre-boarding in Tampa for our flight. Had to be at least 30 people that went on early. We boarded and had another uneventful flight. We did have a couple of laughs at the expense of the person seating by the window in the emergency exit row we were in. He was a young man, looked to be 20-21, and just didn’t seem to be paying attention to his surroundings. The flight attendant wanted everyone’s attention from those in the emergency exit rows and the guy just wouldn’t look up and listen. He finally reached over and lightly tapped him. The guy finally looked at him. After giving us the normal spiel, the attendant wanted a verbal yes from each of us. The guy just stared at him and finally said “I don’t know what you want from me!”. Wanda and I said in union, “just say yes”. He did and the flight attendant looked at him and said ” you’re going to be a trouble maker. I’m going to have to watch you.”. He must have told the other two attendants because there was several comments made to him throughout the flight. Interesting note: all three flight attendants were male. Haven’t seen that before. Got to Buffalo on time and had to wait for our luggage to be off-loaded. We had checked three bags in Houston. Two were in the first twenty that came off, but the last was about 10 minutes later. Go figure. Got the car from National Car Rental and made sure there wasn’t a problem taking it into Canada. By the time we left the parking garage, it was 7 PM and getting dark. We drove the 20 miles or so to Niagara Falls and stopped at a Walmart to get some supplies: water, sodas, cookies, etc. Drove on to the hotel, the Comfort Inn The Pointe, and checked in around 8 PM. We then walked a block to the Hard Rock Cafe - Niagara Falls, NY to grab some supper and drinks. Wanda had the Chicken Marcella and I had the ribs along with a couple of Samuel Adams Octoberfest. We then went back to the hotel to call it a night. We got up in Niagara Falls after our first night around 8 AM, got ready, and went to eat the hotel’s breakfast that was offered for free. We both had scrabbled eggs,sausage patties, and pastries. Pictures from the hotel room at day. I had originally planned on driving and parking, not realizing just how close the hotel really was. Instead, we walked across the street and down a nice pathway to the Niagara Falls State Park Visitor Center, which took only five minutes. I exchanged the online voucher for our passes to allow us to enter each exhibit. First thing we did was to see a movie on Niagara Falls. Told a few interesting events, but I thought it gave a mixed message about what happens to people who try going over the falls. Walked to the nearby Maid of the Mist. This is a boat ride that goes into the mist at the bottom of the falls. We first went out to the observation deck for some good views and them went down an elevator to the river level. We got a poncho to use before boarding the boat, but mine only came down just a few inches below my knees; one size fits all I guess. There was only about 30 people on the boat, which turned out to be good. We had stayed on the lower deck and was able to move around the boat depending on how the wind was blowing. As we neared the Horseshoe Falls, the biggest one, everyone who had went upstairs came downstairs really quickly. It got very wet even on the lower deck. The temperature was in the low 50’s at the time. If the boat was full, as it is normally during the summer, we would not have been able to move around the boat as we did. I took some good pictures and videos. After coming back up the elevator, we dried off and went back to the visitor center to grab a quick lunch from a cafe there. Two over-cooked personal pepperoni pizzas and drinks cost over $20. We then took the park shuttle over to the Discovery Center, which is a museum in the park but is closed except for the weekends, so that we could go to the Aquarium of Niagara that is nearby. To get to the aquarium meant walking across an overpass that was kind of steep. We made it to the aquarium and spent only an hour there. It is kind of small, so unless you can time it for one of the sea lion or penguin feeding shows, it really doesn’t take very long. We got there after one show had just finished and the next was still 45 minutes off, so we decided to go ahead and leave. We then went back over the overpass and has a short wait for the next shuttle, which we rode to the stop for the Cave of the Winds on Goat Island. The cave required another trip down an elevator and out a short tunnel. This exhibit was to walk up to one if the falls on a series of wooden stairs and walkways. They did give us another cheap poncho to use. Got wet enough that I put the camera into the backpack I was carrying to protect it. At one point, I had a misstep and ended up banging up and scrapping my left forearm. Had a bruise the next day, but nothing serious. Took the elevator back up and we dried off as best we could. Got back on the shuttle and continued on through the park listening to narration from the driver. We got off at a stop for the Three Sisters Islands and took a series of walkways and bridges through the islands. 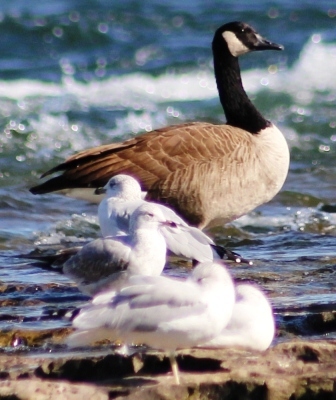 Got a couple of good pictures of the American Rapids and some Canadian Geese. Realized I had never actually seen geese in the wild before today. Pictures from the Niagara Falls State Park. Back to the shuttle and returned to the visitor center. Hit the gift shop and then walked back to the hotel for a chance to clean up an rest before supper. For supper, we walked over to a TGI Friday. Wanda had a trio of appetizers and I had Chicken and Shrimp. Then back to the hotel for the night. Wanda and I got up by 8 AM, cleaned up, and went down for the hotel’s breakfast again. I ended up getting the same things while Wanda got a waffle and a sausage. After breakfast, we packed up, checked out, and loaded the car by around 10 AM. We were only a couple of blocks from the Rainbow Bridge to use for crossing over to Canada. This hotel turned out to be an excellent location for us. Approaching the U.S. Side, we went through a toll booth, where we had to pay $3.50 to cross. There was no check of passport on the USA side, no questions, nothing. Approaching the Canadian side, there was a line for all of the booths. It took about 20 minutes to get to one. The agent took our passports, looked them over, and started asking questions while he was typing on a computer. He asked us about where we were from, what kind of work we did, where we were going and for how long, then what we were here for. I was surprised he didn’t ask about declaring anything. We got through the border crossing and went to the Table Rock parking at the Niagara Falls Park in Canada. There is a large visitor center at Table Rock and we were able to buy passes for the parks shuttle bus at a sales desk. We had planned to do a 4-D show there, but decided we didn’t want to get wet again, after seeing people come out of it dripping wet and wearing more ponchos. We walked around the visitor center for a while and found an ATM to withdraw an additional $400 Canadian dollars for our trip. After having performed some research beforehand, we had determined that the best conversion rate would be through the ATMs. We then went and boarded a shuttle bus to start our day’s adventure. We took the bus up to the north end of the route and saw a large floral clock that chimed every 15 minutes. We got on the next shuttle after hearing the clock chime and went to a butterfly conservatory, where we spent about an hour. It was a large inside enclosure with over 2,000 butterflies flying around. They seemed attracted to Wanda’s white t-shirt. After finishing with the butterflies, we got back on another shuttle and went south to a casino area to eat a late lunch. At the same stop, we went by the Hard Rock Cafe on the Canadian side of Niagara Falls to get a t-shirt and cup for my collection. We then went to a food court area and got chicken sandwiches, fries, and drinks from a KFC Express that served no fried chicken. Pictures from Niagara Falls Canada. Got back to another shuttle bus for the return to Table Rock and arrived at the car around 4:30 to start driving to Toronto. That was when we realized that the car was only displaying miles per hour on the speedometer when I needed kilometers per hour. I was able to quickly change the GPS over to kilometers per hour and used that to keep track on how fast I was going. We got to the hotel in North York, a northern suburb of Toronto, and checked in at the Holiday Inn Express. I asked if they needed to see our passports, but he only needed to see a picture ID for me to check in, so I used my driver’s license. The room was as expected, though it didn’t have wireless Internet, only wired, so my IPAD doesn’t have a connection at this hotel stay. Turns out that I can’t turn on the international data plan for 3G if I can’t connect. After getting cleaned up, we went to a nearby Perkins Family Restaurant for supper. I really enjoy their roast beef with gravy, mashed potato with gravy, and corn with gravy (okay, kidding about the last one). Wanda had a Fettuccine and Spinach Perogies dish. Before we left, I ordered a slice of chocolate silk pie to take back to the hotel, which I ate later on. My wife and I got up before 7 AM, since we wanted to get down to the harbor area early to catch a sightseeing bus. We grabbed some free breakfast at the hotel where I had scrambled eggs, bacon, and a cinnamon roll while Wanda got something; didn’t pay attention. Turned out there were several large groups staying at the hotel and wanted breakfast at the same time. Very crowded in the breakfast area that morning. We ended up not leaving the hotel until 8:30, but we did figure how to change the car’s speedometer over to kilometers, so that helped. We followed the GPS instructions and found an underground parking garage under a Radisson hotel when the GPS indicated that we were close to the destination. Since it indicated we still had a few hundred meters to go, we went looking down the street. Turned out that the sightseeing company’s office was right past the entrance where we turned into the garage. We ended up finally seeing it when we were returning to the car at the end of the day. 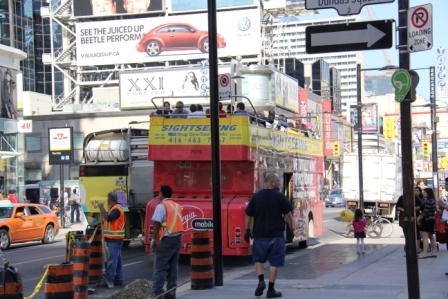 We did finally see one of the City Sightseeing Tour double decker open-top buses pull up near where we were; so we went to buy a couple of tickets. I had a 2-for-1 coupon from a Toronto Entertainment book (entertainment.com), so we felt we had a good deal. Especially since it is good for the whole time we are in Toronto and included a boat ride in the harbor. We boarded the bus and sat on the upper level. The narration was provided by a young man from Calgary named Mark. He was excellent during the time we were on his bus. He had us laughing and he threw in commentary that the other narrators just didn’t match. Of all the bus tours I’ve taken over the years, I would have to say he has been the best narrator that I can remember. Later on, I wished we had stayed on the bus with him the entire route. We ended up getting off at Dundas Square so that we could have a restroom break and we decided to grab a mid-morning snack at Burger King. Since it was 10:40 when we finished there, we decided to wait in the area so I could grab more items for my Hard Rock Cafe souvenir collection from their Hard Rock Cafe Toronto location. It was scheduled to open at 11 AM, but by 11:15, I was telling Wanda that if another bus came before they opened, we were just going to leave. They opened the doors about that time, so we went into the store area. I think there was a problem in their kitchen, because they turned away a couple of people who wanted to eat while we were in there. Pictures of the Hard Rock Cafe Toronto. Pictures from the Hop-On Hop-Off Bus Tour. Another bus came while we were in the location and we were able to board it before it left. We continued on the route, seeing parts of Toronto we would not have visited without going on this, until we got to the Royal Ontario Museum. The Royal Ontario Museum is a natural history museum that is part of the Toronto City Pass vouchers we had bought before leaving on the trip. We went in and I had to first check my backpack, but was told that I could take my camera in. We exchanged our vouchers for a ticket booklet to use at the other locations and they gave us a ticket to enter the ROM. We ended up spending about 3 hours at this museum. It had the normal wide-range of subjects that many of this type of international-level museums have. They did concentrate a bit on the “first tribe” as they call the native Indians that had originally settled in the Toronto area. It is a nice museum to visit. 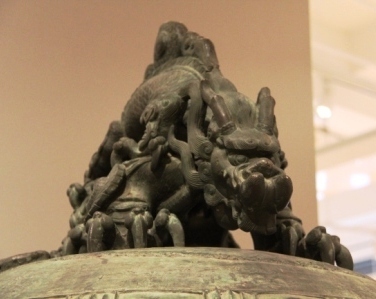 Pictures from the Royal Ontario Museum. After grabbing a soft drink at the museum’s cafe, we got back on one of the buses and took it back to the point we had first started at that morning. This turned out to be the stop for the boat ride that was included in the ticket price. We walked over to a nearby pier and boarded the boat at 4:30 for a 40-60 minute trip. It was a nice relaxing trip around some islands in the Toronto harbor. Pictures from the Hop-On Hop-Off Boat tour. When we finished with the boat tour, we went back to the car and decided to drive to a Nando’s Chicken that we had identified in Toronto. This is a chain of chicken restaurants that we had visited while in London years ago and we really enjoyed. There is only one location in the U.S. and it is up by Washington, D.C. so we have not been to one of these since 2008. We also had a coupon from the Toronto Entertainment book for a good discount on a whole chicken with two sides. In our case, we had roasted corn and spiced rice. Add in a diet coke and a beer and we were all set. It was as good as we remembered it from London. There wasn’t any chicken left by the time we left the restaurant. We returned to the hotel for the evening. Another early morning of getting up at 7:30 AM. We got ready and went down for the hotel’s free breakfast. This morning, instead of scrambled eggs, they had omelets, so we both had one of those and some sausages. I had another cinnamon roll while Wanda had a bagel. Left the hotel at 9:30 AM and made it to Casa Loma in about 30 minutes. 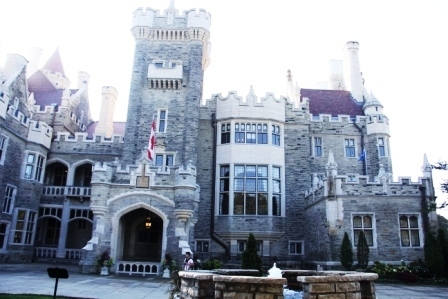 This is a 100 room castle/mansion that a Toronto business man had built in the early 1900’s before he lost money because the Canadian government confiscated a couple of businesses he had invested in for the world war effort and with the stock market crash. He ended up having to sell all his belongings and castle, which was totally completed, for pennies on the dollar to try to pay off his debts. He died penniless, but is still considered a national hero for all the things he had accomplished for the Crown and Canada. They gave him the grandest funeral ceremony ever seen in Canada. The castle is worth seeing and we ended up staying there for over 3 hours. We then drove down to Chinatown and found a small restaurant, called the Forestview Chinese Restaurant, that advertised serving Dim Sum all day. The restaurant was full when we got there and we ended up sitting way in the back, near the kitchen, since this was one of the few small tables available. The women pushing the carts of food kept trying to put plates on our table, so we had to keep saying no to them. One woman was going around yelling out the dishes, that she had for sale, similar to a vendor at a baseball game. 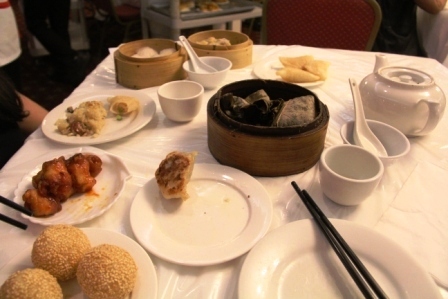 In all the Dim Sum restaurants we have ate in (Houston, Dallas, San Francisco), we have never seen that before. We walked up and down a couple of the streets browsing the store fronts, then returned to the car and drove back down to the harbor area to visit the CN Tower. This had been the biggest tower in the world, after being built, until the one in Dubai was completed. All the signage and graphics still hasn’t been changed to reflect that. We had to pass through a machine that blew puffs of air at us, similar to a few I’ve seen at airports. Wanda asked what it was for and I had to explain that they were checking to make sure there was no explosive particles on our clothing; the concept being that if you had an explosive device, particles would be clinging to you, especially if it was home-made explosives. We took the ride up to the observation deck, in a glass front elevator, taking only 56 seconds to make the trip. We then walked around the upper level, the outside of the lower level, looked through the glass floor, and then went back down another elevator to the bottom of the tower to be let out in a gift shop. Our City Pass included us seeing a 3-D movie or having a motion ride. We elected to see the movie about surfing. It was okay, but nothing great. 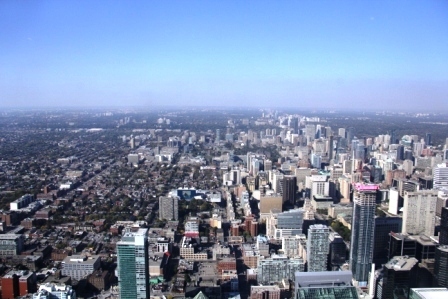 Pictures from the CN Tower. Since it was 4:30 by then, we headed back to the hotel. A few hours later, we went out and grabbed some food from a nearby McDonalds and brought it back to the hotel. Wanda wanted to wash clothes here, before we left for Ottawa, since the next hotel didn’t have a guest laundry. Note: the McDonalds’ menu here in Toronto seems to be about the same as in the U.S. No different menu items with this fast-food restaurant like we’ve seen when traveling in another country. Today is Canada’s Thanksgiving, so a lot of places are closed. The Toronto Zoo is open, so we decided to go there for the day. We got up at 7:30 again and went through the normal routine of getting ready and having the free hotel breakfast. Today was a bagel, eggs, and bacon for both of us. It wasn’t crowded in the breakfast area this morning; the previous two mornings were terrible with very large groups trying to eat when we were in the breakfast room. 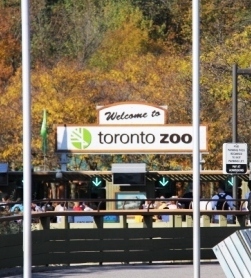 We drove to the Toronto Zoo and reached there about 10 AM. We used the tickets from the City Pass, so admission wasn’t an added expense, but we had to pay $10 for parking, $5 to see a shark and stingray touching exhibit, and $15 for all-day passes to the zoo mobile. Some may say we really didn’t need to do the extra stuff, but that $15 was probably the best expense we have paid during this trip. We really needed it by the end of the day. The weather started off fantastic, but got close to 80 and humid by mid-day. Thought we left that in Texas. Since the shark and stingray exhibit was popular, we decided to do it first and so walked from the gate area to the Discovery Zone / children’s zoo where they had a large temporary enclosure set up to house a very large touching tank. They had about 5-6 sharks in it and about 30 stingrays that were swimming around, but didn’t seem to want to be touched. This was the last day this exhibit was going to be open. After that exhibit, we walked through the children’s zoo for a while and then back to the gate area to catch the zoo mobile. We took it around the whole zoo listening to the commentary and getting our bearings. They force everyone off back at the gate area while the other stops are optional for getting off. When we returned to the gate area, we decided to grab a bite to eat and first went to a place called Peacock Cafe in that area, but decided to try another place on the other side of the Discovery Zone. After lunch, we went back to the Discovery Zone to watch a bird show that was only appearing at 1 PM for the last day of the season. 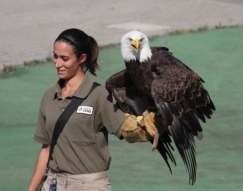 The show was only 20 minutes long and showcased several birds that they had taught tricks to. The first was a bald eagle and he looked very impressive while flying over our heads, landing behind us on a grassy hill, and flying back to the stage area. We grabbed a bottle of water after the show and carried it with us. We walked the rest of the afternoon around various parts of the zoo. We had just climbed up a very long, steep hill (after first going down it to see some exhibits), found ourselves exhausted, and on the opposite side of the zoo with it closing in less than an hour. This is where the all-day pass for the zoo mobile came in handy. We took it back to the gate area instead of having to walk. This zoo turned out to be enormous and the animal exhibits are way too spread out. It is unlikely that most people can do it in a day. If the zoo added some escalators, it would remind me a lot of the San Diego Zoo. Pictures from the Toronto Zoo. We stopped at a gift shop before leaving the zoo and then headed back to the hotel. We both cleaned up some and then went looking for a place to eat supper. Wanda wanted to eat a Canadian Thanksgiving dinner, but the place we had planned to go to ended up closing at 5 PM. We saw a couple of fast food places open, but had trouble finding what we wanted. After about 30 minutes of driving around, we saw a place called Swiss Chalet that said it was a rotisserie and grill. We stopped and ended up having rotisserie chicken, mashed potatoes, sweet potatoes, chicken soup, pumpkin pie, pumpkin cheesecake, and a Canadian beer. This satisfied both of us for what we wanted and needed. We then returned to the hotel to pack up for leaving the next day and relaxed for the evening. We slept a little later this morning before running down and getting breakfast. We then finished packing and checked out of the hotel around 10 AM. Went by a gas station and filled up the car; turns out that our credit cards will not work in the outside gas pumps, so I had to go inside and pay. Do you know how many years it has been since I had to go inside a store or station and pay for gas? I had to pay $55 for 3/4 of a tank and I don’t have my Honda Pilot to drive. We also stopped by a supermarket called Price Cutters to pick up more sodas, granola bars, and cookies. Ended up costing about $30. We really are lucky in Houston for how cheap it is with buying food in supermarkets and restaurants. Finally started driving about 10:30 for Ottawa. Some of the scenary while driving through Ontario. 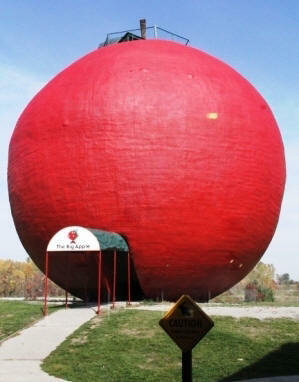 The plan was to stop in Colborne to visit The Big Apple. 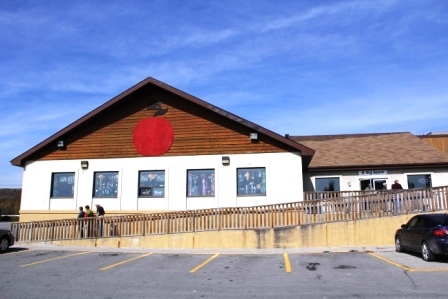 This is a place known for it’s apple pies and other apple products; some people like the food and some people hate the food. Seems to have started in a roadside stand that looks like an apple. 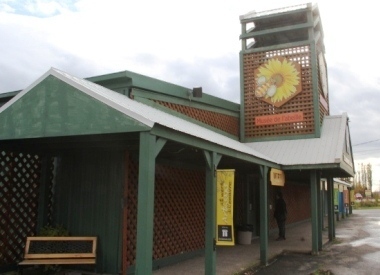 It now occupies a large restaurant, pie making area, and store. We stopped and ate lunch there. I had double hamburger patties between three pieces of sourdough bread and smothered with gravy. Also had over cooked fries and a can of iced tea. Wanda ended up with Poutine (fries smothered with grave and covered with cheese curds) along with a Diet Pepsi. We also had to try their specialty products. I had the traditional apple pie slice and Wanda had an apple turnover. The pie slice filling was tasty, but the dough was a little dry. The turnover had no flavor to it. Took some pictures and looked around the store, then got back on the road. Pictures from The Big Apple. Before Kingston, we ended up hitting stop-and-go traffic twice. The first was from an accident and both lanes were having to merge to go around the accident on the shoulder of the road. The second stop-and-go situation was only a couple of kilometers from the first and probably had caused the first. Several kilometers of roadwork was requiring traffic to merge into one lane. We ended getting off and taking a break at a service center in Odessa before getting back in the middle of the traffic. These two things ended up delaying us about a hour and a half behind schedule. While at the service center, we ended up buying a Canadian map book for Wanda to follow where we were while driving. Turns out that while the GPS helped me, it didn't do anything for her as a passenger and she wanted the ability to look for herself. Unfortunately, we ended up leaving this book at the hotel in Ottawa when we left there later on. I had planned on stopping at an observation tower overlooking an area called 1,000 Islands, but due to the delay and Wanda being asleep at the time, I just kept driving. Have to say hat the weather was perfect today in the low 70’s and the colors were fantastic with the foliage. We got to Ottawa and reached the hotel right before dark. We checked in to the Holiday Inn Express Ottawa Airport, unloaded the car, and took the luggage up to the room. They had upgraded us to a 2-room suite, which is nice. Pictures of the Holiday Inn Express Ottawa Airport room. After getting settled in, we decided to go and grab fast food tonight. We found a Wendy’s nearby and ate there. Then back to then hotel to relax for the evening. Same routine as on previous mornings - woke up, got ready, got breakfast, and left the hotel. The only difference was that we started at 6:30 to try to get tour tickets to Parliament that are passed out each day at 9 AM on a first-come first-served basis. Turns out Ottawa has traffic problems like most major cities and we ran into them. We got to the Visitor Center for Parliament about 9:20 and got tickets for a 9:50 English speaking tour. Yes, the picture has a large crane in front of the building. Work was going on the whole time we were there. It is a multi-year project refurbishing the building. The young lady sent us on through the security checkpoint, where we had to do everything similar to an airport, except we didn’t have to remove our shoes. We got through it in about 5 minutes, due to a class of students going through at the same time, and had to wait in an area while other tours (several school groups and a French speaking tour) went first. Think we started around 10 AM. We were first taken up to the House of Commons to see that chamber, then went to the Library of Parliament, and finally to the Senate chamber. The tour guide, Hannah, gave us a good idea of how their government work. Some similarities to ours, but with the Queen and her representative, the Governor-General, still involved. Parliament can be disbanded by either the Queen or the Governor-General, when a loss of confidence occurs, and new elections are then held requiring a party to get a majority to form the government or to form a coalition for government. This tour was well worth the time it took to do it. 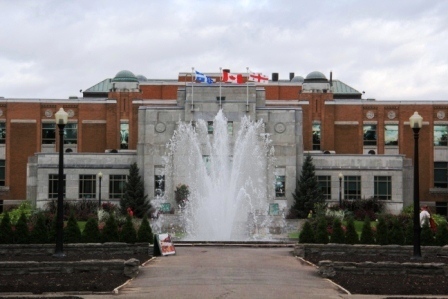 At the end, we went up the Peace Tower, which is the large bell tower of the central facility, and then in to their memorial room where they keep roll books of all the Canadians lost in domestic or international wars. We had to wait to enter because they were having a ceremony to “change the pages”, which was literally turning the pages in each of the roll books. Not sure how often they do that, but it is a very formal ceremony. We ended our time there by going through a gift store. Wanda found a t-shirt she wanted and went to wait in line to check out; amid a large group of school kids. She was patient, but I was getting frustrated when some of the kids would cut in front of her. And of course, quite a few wouldn’t have enough money and would beg others until they finally gave in or the counter personnel made them find something else. Then there were those who paid in all coins and the counter personnel had to stand and count it all. At one point, I started to say that I would pay for all of them in front of Wanda, but I realized just how much candy some of those kids had. We left Parliament and walked across the street to the Info Centre (which has since closed according to this article) to see what they had to offer. We decided then to change our plans, get lunch, and see the National Gallery during the afternoon, since it was within walking distance. On the way to the National Gallery, there just happened to be Ottawa’s Hard Rock Cafe, so we stopped to eat there and to get my souvenirs for my collection. Pictures of the Info Centre. ByWard Market area near the Hard Rock Cafe. Pictures of Rideau Canal Waterway. Pictures of Hard Rock Cafe Ottawa. As we passed by Ottawa’s Notre Dame, we saw some kind of event happening out front of it. It looked like a wedding party waiting for the couple to leave the church, but we never found out for sure. There were a lot of uniforms in front formed in a couple of lines. Pictures of Notre Dame Cathedral. When we got to the National Gallery, we were able to use a 2-for-1 coupon from the Entertainment book, which meant admittance only cost us $9. We had to check my backpack and camera, which they locked up in a secure locker and gave the key to me. Even though the web site said you could take pictures in the public areas, they really meant the foyer area only. The National Gallery museum had a lot of contemporary art. One exhibit was just somebody’s photos from traveling around Canada. Another one was a truck trailer just sitting there. Others looked like people just threw stuff together. There are some mixed-up “artists” in this world. Another section had works from Canadian artists. There was also an area with European artists that included works from Picasso, Monet, and others that are famous, but not a lot. This museum was kind of a disappointment. We stopped by the gift store, but didn’t see anything we wanted. 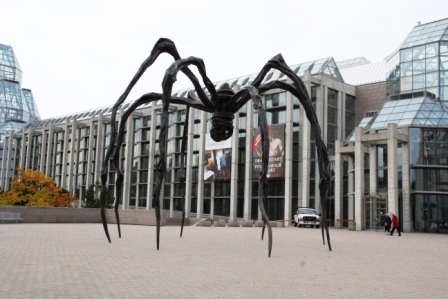 Pictures of the exterior of the National Gallery of Canada. The "new" US Embassy in Ottawa. Memorial to troops near the Gallery. We left the gallery, walked back to the car, and returned to the hotel. Wanda searched on the internet for a place to eat. She still wanted a turkey meal, since we weren’t able to get one on Monday for Thanksgiving. I was able to find another Perkins Family Restaurant that wasn’t too far away and had more reasonable hours than the one in Toronto. We went there and we both had turkey dinners and left the restaurant full. We then returned to the hotel for the night. Normal morning routine with breakfast consisting of an omelet, sausage, and bacon for me while Wanda decided on just cereal. We left the hotel and got to our first destination of the day at about 10:30. There was a light rain falling most of the day. Our first destination was the Royal Canadian Mounted Police training camp for the group called the Musical Carousel. 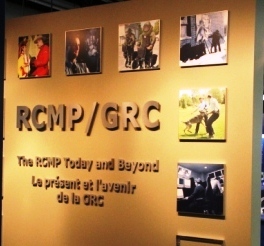 This is the only part of the RCMP that have ridden horses officially since the 1930’s. According to what we understood the guide to say, the RCMP currently do not participate in police matters. Their members normally are rotated personnel from the Canadian Police Force who serve a 1 or 2 year period and then rotate back to the CPF. Only the instructors serve longer periods of time. The Musical Carousel is a good-will group that goes around and performs extensive horse maneuvers upon requests by communities or organizations while dressed as Mounties are expected to be. They also have their own breeding farm. What we saw today was their stables and some training areas. We happened to arrive just as a tour was starting up and was able to join it. Nice tour especially since it was free. The only bad thing I could say about it was that the visitor parking is not clearly marked and we had trouble finding a place to park. I finally just pulled to a side of one of their roads, that did not have a no parking sign on it, and parked. Would have been just my luck to get a parking ticket in the middle of a police training camp. Pictures of the RCMP Musical Carousel Training Camp. Our next stop had us going a couple of kilometers to the Canadian Air & Space Museum. We had a 2-for-1 coupon from the Entertainment book for admission. They have a large collection of planes from around the world. Not as large as the U.S. Air Force museum at Wright-Patterson Air Force Base in Ohio, but still decent. While we were there, one of the workers gave an informative presentation on flight suits and ejection seats. 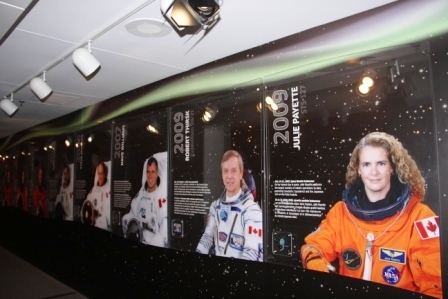 They also have a small exhibit on space exploration and on the different Canadians who have went to space. Fourteen Canadians flew on the space shuttle and one went up and back on a Soyuz. Pictures from the Canadian Air & Space Museum. 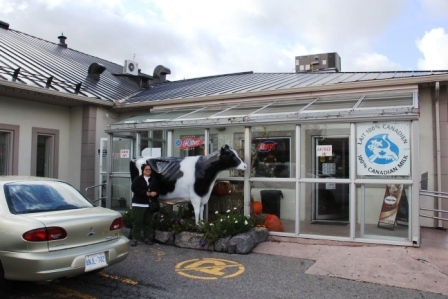 We drove back toward the hotel and grabbed lunch at a Canadian hamburger chain named Harvey’s. They were okay; nothing special. 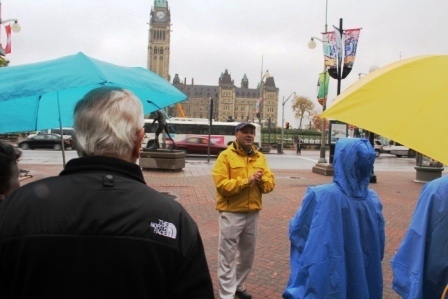 We were scheduled for the Ottawa Walking Tour to begin at 3:30 P.M. Wanda decided that with the rain, she didn’t want to go on a walking tour; especially with all the walking we have been doing. I dropped her off at the hotel and drove back into Ottawa for the tour. We met at the front of the Info Centre across from Parliament Hill. Craig MacDonald collected the group that was waiting for him and collected payment as well. There were 10 of us: a mother and her 2 sons from New York, a couple from Australia, a couple from Scotland, a couple from Ontario that are friends of Craig’s sister, and myself. Craig is a high school history teacher that does these tours after school, on weekends, and during school breaks. Craig started off giving us a history of the city and the federal government, and then about the buildings surrounding us. We then walked a short distance to the War Memorial and the Tomb of the Unknown Soldier from the 1st World War. He discussed how Elgin Street had divided the city by means and religion. The wealthy Protestants lived west of the street in Central Town and the poor Catholics lived east of the street in Lower Town. We then went down Sparks Street that had at one time been the locations of the most important businesses. It is now mainly government offices, news services and a couple of major banks. He pointed out several locations used by politicians for making announcements and holding press conferences. He also showed us the door that the Canadian Prime Minister uses to go in and out of his office. It is a small, non-descriptive door at the back of the building. It turns out that the largest employer in Ottawa is the governments. 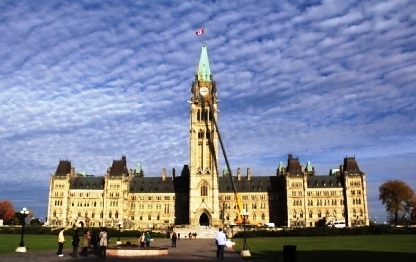 An estimated 90% of the people in Ottawa works for some level of government. The next highest employer is the high tech industry and the third is the tourism industry. Sometime while we were on Sparks Street, the rain stopped. Our next stop was in the Bank of Canada. They have a real nice garden area inside their building that they set up tables and chairs in so that during the winter months the people working for the Department of Finance across the street can bring their lunches and eat in a relaxing environment. They also have the Currency Museum there that he recommends, takes about 1-2 hours to really go through, and is free. It contains every example of currency ever used in Canada. Out the other side of the bank and we were on Wellington Street. We crossed the street and entered Parliament Hill behind the West Block. We went around to the front of the West Block and along the western side of the Center Block where we saw the Cat Sanctuary. Cats were originally used in Parliament to try to control rats. In the 1950’s they swapped to using chemicals, but some of the groundskeepers kept feeding the cats. In the 1970’s, a woman who worked there started feeding them at the location of the present structure and continued until she died. A co-worker helped her in her later years and continued on following her death. He arranged for the structure to rebuilt to house 12 cats who are free to roam at will, but are neutered/spayed and provided shots. Any additional strays are taken to the SPCA. The next stop was behind the Centre Block of Parliament for a description on the part of the city across the river and how this is a location where three rivers meet. We then went around the east side of the Centre Block to see the monument for the five ladies credited for women’s rights awareness in Canada. It is named The Famous Five and is considered the most recognizable monument in Canada. Craig then gave a discussion on the politics involved in women getting the right to vote in federal elections and each province. The federal right occurred when the current Prime Minister wanted to get conscription (draft) passed for Wold War I, but was having problem due to he French-Canadians being against it. However, he found ghat most women were for it, so he worked to get most women the right to vote in March 1918. As Craig put it, the law went into effect, the vote for Parliament occurred the next day, and the Parliament passed the conscription act the following day. Each province had their own timetables for passing the right in provincial and local elections. Quebec was last in 1940. We then went by the Rideau Canal and stopped in what is now the Fairmont Hotel Chateau Laurier. Craig went into a discussion about how the canal was started in 1826, took 6 years to build and was to be used in case the USA limited Canada’s ability to use the Great Lakes to ferry troops and materials in war situations. Remember that this was after the 1812 war between our two nations, so was a valid concern. The canal is a series of locks that stretches across over 200 kilometers from Lake Ontario at Kingston to the Ottawa River in downtown Ottawa. It is currently used for pleasure craft and tours now. Several years ago, to attract tourists during the winter months, they started draining the canal before it started freezing and leaving only about 2 feet of water in it. This then becomes the longest skating rink in the world. An offshoot was soon seen when over 25,000 employs downtown started skating too and from work. It is estimated now that over 10,000 cars are taken off the road during the winter months. The history of the Chateau Laurier was provided along with some other information. A movie involving James Earl Jones and Reese Witherspoon is currently being filmed in Ottawa and they are staying at that hotel. No, we didn’t see them. Craig also told how a couple of months ago, he was giving another tour and was walking backwards in hallway there, talking to the tour participants, and ended up knocking someone over. It turned out to be Nancy Pelosi. He helped her up and made sure she was okay. We left the Fairmont hotel and walked past the “new” location of the U.S. Embassy that was opened in 1999. It is supposed to look like a submerging submarine and looks ugly. 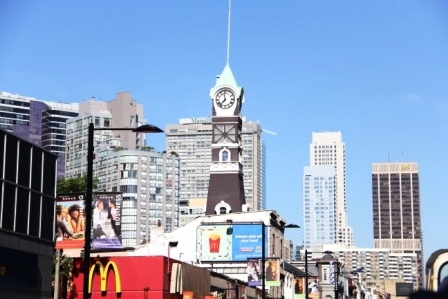 We continued to the ByWard Market that is the new up and coming area. It has 366 eating locations in it, a farmer’s market that has ran since the 1800’s, and is currently the home of stars like Matthew Perry. This is where we ended the tour. It was excellent and lasted a little over 2 hours. I would highly recommend it. Pictures from the Ottawa Walking Tour. I walked back to the car and drove back to the hotel. After cleaning up a little, we went out to a nearby Chinese buffet for supper and then returned to the hotel for the night. One more full day in Ottawa and we are “discussing” just how to spend that day. So many things we would like to see. 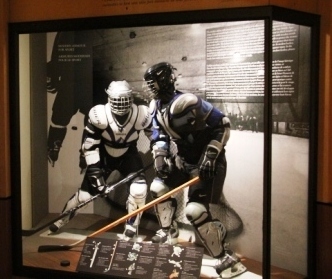 We went through the same morning ritual and arrived at the Canadian Museum of Civilization in Gatineau, QC about 9:45 AM. This is the part of Ottawa that is located in Quebec across the Ottawa River from Parliament Hill. 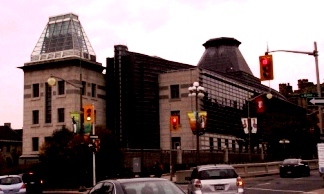 We took a while to walk through the exhibits for the First Tribes (indigenous natives), the Canadian Hall (history of Canada from the European perspective), the Postal Museum (mail delivery and 3,000 stamps), the Children’s Museum (quick walk-through), and Face-to-Face (exhibits of important people in Canada’s history). Quite a few high school groups seemed to be at the museum that day. We stopped by their cafeteria to share a slice of pepperoni pizza, a chocolate muffin, and a diet Pepsi. Not the best lunch, but after having a large breakfast, it was good enough. Pictures from the Canadian Museum of Civilization. After spending almost 4 1/2 hours at the museum, we then went over to the Royal Canadian Mint in time to join an English tour at 3 PM. We first had to park at the National Gallery, which we had previously visited, and walk a block or so to the mint, where we had to pay while standing outside of the gated entrance at this small kiosk. Did I mention it was raining most of the day? After climbing a long staircase, we had to wait for about 15 minutes in a gift store until the tour started. The tour at the mint had us walking around a corridor with glass panels overlooking the work being done producing silver stock, flattening the stock to the right thickness, punching out blank coins, and then putting on the designs. The tour guide, Benoit, provided a decent explanation of the process. Unfortunately, they do not allow photography on the tour. We were able to take a couple of pictures of some gold bars in the gift store. 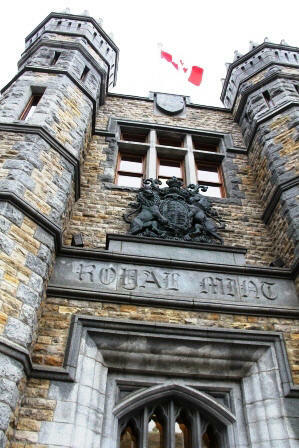 Pictures from the Royal Canadian Mint. Following the tour, we went back to the parking garage at the National Gallery, got the car, and then drove over to the St. Laurent mall to grab some supper at an A&W using a 2- for-1 coupon. Then we returned to the hotel to get ready for tomorrow when we drive to Montreal. We went through the normal morning routine, finished packing up, checked out of the hotel, loaded the car, and started our trip to Montreal by around 10 AM. According the the GPS, it was just under 200 km, so should take just over 2 hours. I had filled up the car the previous day, so didn’t have to worry about getting any gas. About 65 km away from Ottawa, we saw a sign for St. Albert Cheese and decided to drive there (about 16 km out of the way) and see what they had. When we arrived, we entered this small shop and off to the side was a viewing area of the cheese production and a video (in French). There were several workers cleaning up the equipment after the mornings production. Cheese is normally only made during the morning, starting very early, with the delivery of fresh milk from the farms. We had seen the same type of setup in Pennsylvania years ago when we visited there. We ended up buying a package of yellow cheddar, one white cheddar, and then another package of maple syrup fudge. The two cheeses had been made fresh that morning. Pictures of St. Alberts Cheese. When we bought the stuff, I didn’t expect any of the cheese or fudge to make it home (and it didn’t). We stopped again after crossing over into Quebec, a little over 100 km from Ottawa, for a bathroom break and to visit a visitor information center. Back on the road, I noticed an immediate difference between Ontario and Quebec. In Ontario, all the official signs had both English and French on them. In Quebec, there is only French. If they seriously want tourism in Quebec, they need to change that. Some of the view between Ottawa and Montreal. We drove on to Montreal and ended up checking in early, a little after 1:30 PM. The hotel has an underground garage that we parked in and unloaded the car. We have a 2-room suite with a kitchen on the 12th floor facing the old town and port areas. Pictures of the hotel room at the Candlewood Suites. Pictures of the views from the hotel room. We had planned on going to an art museum this afternoon, but Wanda had noticed yesterday that it was moving to a new location and opening there this weekend. Admission is free this weekend, but not all the galleries will be open for a couple of months. We decided not to go. Instead we washed clothes using the free guest laundry that Montreal Downtown Centre Ville Candlewood Suites offers. Since we hadn’t eaten lunch, we ate some of the cheese, fudge, cookies, and granola bars we have with us. Very nutritious. The laundry was done about 5 PM, so we decided to walk around near the hotel in the Chinatown area. 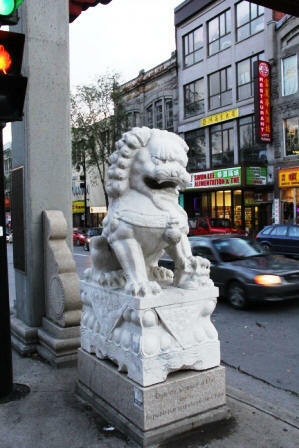 This hotel is located between Chinatown and the Latin Quarter. As we started walking down the street in front of the hotel, we noticed that traffic going in the same direction was stopped and a lot of the cars in down a couple of blocks was honking there horns at a crowd of people. We also could see police cars with their lights flashing, but moving slowly. We walked toward the “excitement” and was able to see that this crowd of less than a 100 was walking down the middle of the street blocking traffic with three police cars following right behind them. As we got nearer, quite a few more police vehicles started showing up with the words “Intervention” and two with “Intervention Supervisor” on them. This was a good indication for us to disappear, so we cut into Chinatown. Pictures of the Occupy Montreal mob. Found a place called Hong Kong Restaurant where we ordered beef, shrimp, and pork dishes with steamed rice and hot tea. Finished everything but the beef chow mien, which we brought back to the hotel with us. The pork and shrimp dishes were great, but the beef and noddles dish was a little bland. The place was packed by the time we left. It wasn’t very big, but the service was good and the food got to us in a reasonable time. Back to the hotel for the night. This hotel doesn’t serve breakfast, so not sure how the morning will go. Got up around 8 AM and got ready to go out. Breakfast was a granola bar this morning, which we had previously bought at one of the supermarket stops we had made. We walked over to the Champ-de-Mars subway station and bought a 3-day transportation card to use on Montreal’s public transportation. We probably won’t use the third day, but the cost of the 3-day is the same as two 1-day cards, so we decided to go ahead with the extra insurance in case we decide to do something Tuesday morning. We had planned on getting the 3-day museum pass with transportation, but with the change of plans yesterday, I didn’t think it would be cost effective. We ended up having to pay with cash because the credit card would not work in the machine at the subway station. Has to do with some machines only taking "chipped" credit cards. We rode the orange line down 3 stops to the Bonaventure station and got off there. I noticed that the subways, for the most part, did not seem as crowded here as they are in Europe. We were trying to get to the starting point of the Hop-on Hop-off Double-Decker Bus by 10 AM that was running it’s last day of the season. We had planned to do it tomorrow, but when I checked the website yesterday, I noticed the schedule change. We arrived at Dorchester Park, the starting point, at 10:15 and saw the bus pulling away as we approached. The bus line was only doing four runs today (10, 11, 12, 1), so we wanted to ride it once all the way around (2 hours) to get an idea if what the city offers. One thing I’ve noticed here in Canada, frequently the scheduled time is a guideline for something to happen. Many times the event started when they felt ready to do it; hence the late start of he bus. We went inside the visitor center for Gray Line, bought the needed tickets, then went downstairs to use the restroom and wait for a while in a closed food court area they had in the building. Since it was cold today, the high only being planned at 12 degrees Centigrade, we wanted to be on top of the bus, but in the first row so we had protection from the glass windshield built along the front. We went upstairs an outside to wait for the bus about 15 minutes before the scheduled start at 11 AM. As we were waiting, I got in a conversation with the husband of his couple from Queensland, Australia concerning our cameras. He has a Cannon 400 D. They are on a cruise that will take them to Quebec City tomorrow, the Halifax, and eventually Boston with an end in New York City. He currently works in real estate. The bus arrived right at 11 AM and we were the third couple to get on. The first couple stayed downstairs, the couple from Australia went to the left-hand seats in the first row on top and we took the right-hand seats. The bus started at 11:10 and we spent the next two hours being cold, but enjoying the ride. By the end of the round trip, the other couple, Wanda, and I were the only ones left on top. Think we started with twenty people on top. We went by places such as the Notre Dame Basilica, Old Port, Chinatown, The Montreal Science Center, The Mount Royal Park and St. Joseph’s Oratory, and the Casino de Montreal. First time I’ve been on a hop-on hop-off bus tour and one of their stops is a casino. 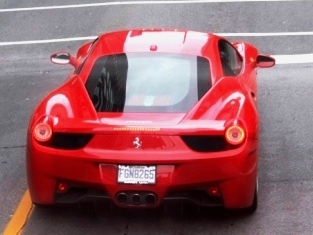 Okay, with all the pictures I took while on the tour, had to show the Ferrari. At the end of the tour, we visited the restrooms again and then went to a restaurant in the square that the tour guide had recommended called Dunn’s Famous. This is a Montreal based chain that specializes in smoked meats. I got a platter which included smoked meat, four pieces of bread, fries, cole slaw, and a pickle. Wanda got a sandwich with about the same amount of stuff, but with mustard on her bread and also chicken liver. It was pretty good, but too many fries. 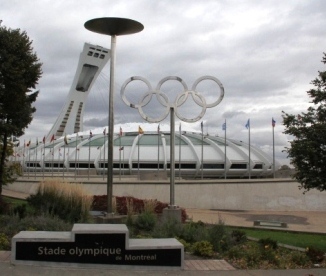 During lunch, we decided to take the subway from the nearby Peel station to the Viau station (green line) to go ahead and visit the Biodome at the Olympic Stadium. This is basically an environmental zoo inside one of the previous buildings used during the Montreal games. 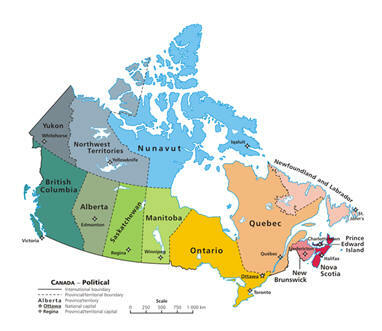 They have it split up in four environments: tropical forest, maple country, gulf of St. Laurent, and the sub-Antarctic. It took only about 90 minutes to go through, even though it was crowded. We had bought a combination ticket, so plan to return tomorrow for the Insectarium and the botanical garden. Pictures from the Biodome at Olympic Park. After going through the gift store, we returned to the subway and returned to the Saint-Laurent station, which is one of four near our hotel. We had to walk through a bunch of construction areas to get to the hotel, so we may not use that one again. After resting up for about an hour, we went to a Days Inn next door to try the food a the Allegro Resto-Bar. I had their BBQ pork ribs and loved it. Back to the hotel for the evening. Got ready this morning and a granola bar happened to be breakfast again. We had talked about walking over to Chinatown and getting buns with meat in them, but decided against it. 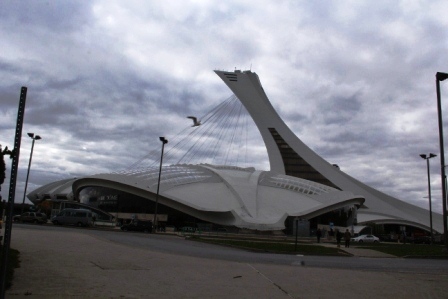 Instead, we went ahead and took the subway back to the Olympic park area and used the tickets from yesterday to enter the Botanical Gardens and the Insectarium de Montreal. Gate areas at either place allows access to both exhibits, that is why only one ticket was needed for the two. We weren’t sure of that beforehand, but found this out after arriving through the Botanical Gardens. Both places were full of school groups. 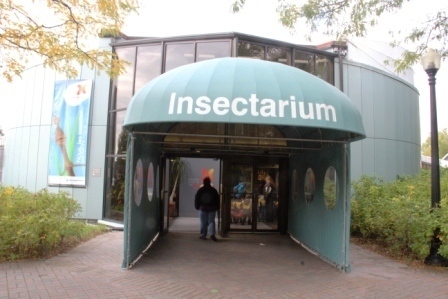 We went into the Insectarium and found it a lot smaller than expected. 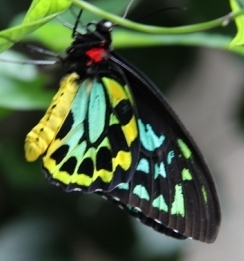 It is mainly displays of dead insects, though there are some terrariums with live insects. Also, there were exhibits that were supposed to have ants crawling along limbs going from one enclosed area to another, as well as bees flying down tubs of clear plastic from the outside to inside glass hives, but both insects had been removed due to the cold. It also had a film that was shown in French and English, but we didn’t wait to see the English version. Several of the workers, one dressed as a spider, gave a presentation to the kids on how spiders act and how they capture prey. It was all in French and was done on a stage with a large metal spider web stretching from the floor to the 2-story ceiling. The girl in the spider outfit was attached to safety lines being manipulated by another worker to allow her to go up and down the web or make short leaps. We then went walking through some of the botanical garden, including part of the rose displays and the Chinese garden. They are having a festival of lights using Chinese lanterns and large plastic displays of Chinese characters, animals, and legends all with lights in them. Probably looks great at night. Pictures from the Botanical Gardens. After being there a couple of hours, we took the subway back to the old town area, got off at the Place-d’Armes station, and walked to the nearby Basilique Notre-Dame de Montreal. 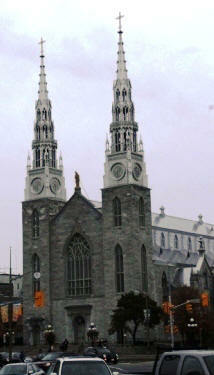 This is the church that Celine Dion was married at and the people of Montreal make sure you know it. We had heard about it yesterday on the bus tour. We also heard it again when we participated in an English speaking 20 minute tour held at the church. The Basilique (or Basilica) is a very beautiful building both inside and out. It is lite inside with soft blue lights and is very elegant. In my opinion, it is easily on par with Notre Dame in Paris. Definitely need to visit it if you get a chance one day. We were told there is up to a 20 month waiting list, depending on what day you want, for weddings to be held there. Celine Dion did not have to wait as was pointed out to the tour group by our guide at the Basilique and by the tour guide on the bus the previous day. I had planned on us seeing the sound and light show held inside each evening, but we were unable to find time during one of the evenings to see it. Maybe next time. Pictures of the Notre Dame Basillica. After finishing our visit there, we walked a couple of streets of old town to find a French restaurant to have a late lunch. We came across a small place called Restaurant Le Bourlingueur. I got a roasted pork dish cooked in apples and applesauce and Wanda got a chicken breast stuffed with goat cheese and sun-dried tomatoes. Based on the choices we made, both meals came with celery soup, bread, roasted potatoes, red cabbage, and a desert of baked apples with cinnamon. The food was excellent and quite tasty. Yes, for those about to ask, I did eat everything. Pictures of the exterior of Restaurant Le Bourlingueur. It was starting to rain after our late lunch, so we first stopped by a small shop called Bastix Souvenir that we saw on the street and by a small market called Couche-Tard on the way back to the hotel and then went back to the room. Supper is all the leftovers Wanda has brought back from our various meals in Montreal and put in the refrigerator at the hotel. We decided to wash clothes again before leaving Montreal so that we could take advantage of the free washers and dryers again. Tomorrow is our drive to Quebec City. We took it easy this morning, slept a little later, then got cleaned up and walked over to Chinatown to grab some buns with meat plus some red bean paste balls that Wanda always likes to get. We brought those items back to the hotel, ate most of them, then finished packing and loaded the car. When I checked out, they didn’t have us paying anything since we were staying on points. However, I knew that we should have charges for parking and brought that to their attention. Somehow, when we checked in and filled out the form, they never transferred it to the computer. I would rather deal with it now than have it pop up later. We ended up pulling away from the hotel about 11:15. We were planning to stop about halfway to take a break, but there wasn’t anything convenient in the right location. We were only about 30 minutes from Quebec City when we finally stopped at a Subway sandwich location. We grabbed a late lunch and got back on the road. Our first stop was actually 30 kilometers on the opposite side of the city. Located in the small community of Chateau-Richer was a small ecomuseum that dealt with honey that I wanted to see. The name is Musee de L’Abeille (Bee Museum). 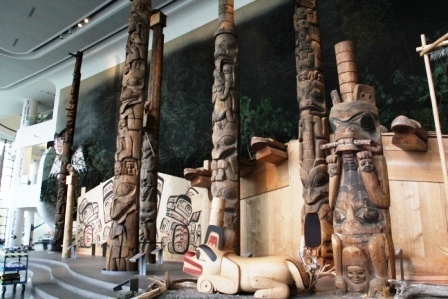 An ecomuseum is a small operation with tours (or small museum or exhibits) and a store, usually ran by a family, dealing with natural products or materials. The place wasn’t giving tours at this time of year, but I was able to do a taste-test of four different types of wine/mead that they make with the honey and other products from the area. We were the only people there at the time and the ladies gave us a lot of attention. We ended up buying some wine, candy and other items. The next stop was on the way back to the city and is a falls that is touted as being one and a half times taller than Niagara Falls named Montmorency Falls. It may be taller, but not quite as impressive. Went up on a gondola to the top and walked across the suspension bridge over the falls. 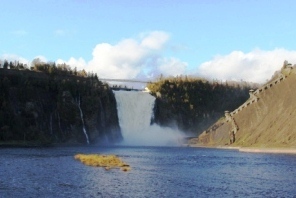 Pictures of the Montmorency Falls. We drove back to the city in search of our hotel now. It is a new line of boutique hotels that Choice Hotels is carrying now and we have our stay there using points. Called the Hotel Royal William, we had some trouble finding it. Parked in front on the street at first and went in to check in. The lady said we could unload the car there, but the garage normally used is being cleaned that day and we would have to park at another place down the road a couple of blocks for the night. We unloaded the car and the took it to this other location. Not easy on a series of one-way streets that aren’t always going the same one-way. We finally made it and parked the car. Pictures of the hotel room at Hotel Royal William. It was 6:30 PM by now and starting to sprinkle. I talked Wanda into stopping by a Japanese Sushi restaurant called the Yuzu Resto + Club, that was nearby, to get supper and get out of the rain. Since she likes Sushi, it wasn’t really a hard sell. By the time we finished, it had stopped raining, so we went back to the hotel and relaxed for the rest of the evening. After getting ready for the day, we went downstairs to the restaurant to see what was included with the free breakfast. It turned out not to be much (toast and fruit), but we could upgrade to a better breakfast with paying the regular price minus $5 each. I ordered a ham and cheese omelet with breakfast potatoes, toast, fruit, and orange juice while Wanda ordered two eggs with potatoes, toast, bacon, fruit, and coffee. It came to be $10.91 before the tip, and they gave us a lot of food. Turned out to be quite good. We walked down the street and got the car from where we parked it the previous night. We then drove over to the La Citadel de Quebec to tour it and arrived at 10:15 AM. The tours are on the hour, so we had to wait for the next one at 11 AM. The entrance was strange and we didn’t understand it as we drove in. As you approached the entrance, there was a parking lot for buses and large vehicles. There was also a guard shack (empty) with a stop light that was showing red. We stopped for a couple of minutes and then drove through this very narrow alley way between the Citadel’s ramparts for about 100 yards. It then opened up and signs for free visitor’s parking for 2 hours lined the walls of the ramparts with spaces for cars marked out on either side. We kept driving around until we got to the gate area where it opened up more and there was some empty areas nearby. Since this is an active military base, you can’t walk around inside without a guide, so we had to wait in an area comprised of a small indoor snack area, a small gift shop, and a roped off area inside the inner outside portion of the citadel that contained benches and picnic tables. Tickets for the tour were being sold in the gift shop. The weather was clear and sunny with temperatures in the mid to upper 50s. At 11 AM, Nancy, our guide, came out to where we and other people were waiting in the outside area. There ended up being about 20 people in the tour group. Nancy gathered us together, explained about the history of the Citadel, took us through the 22nd Regimental museum, up on two different points of the Citadel’s ramparts, to a prison used as a museum for displaying recent actions and medals, and then ended the tour back where we started; all in a little over an hour. Decent tour, great views from the ramparts. The Citadel was built on the highest natural point in the city. After returning to the car, we decided to visit old town and started leaving the Citadel. Directions to the exit are non-existent, so we found it with educated guesses. It was then we discovered that we had been lucky coming into the Citadel. As we approached the same narrow alley, there was a sign and another stoplight saying to wait for a green light. Vehicles coming in and going out use the same alley and there is not room enough to pass anything bigger than a person and even that is chancy. We got the green light and went through with no problems. 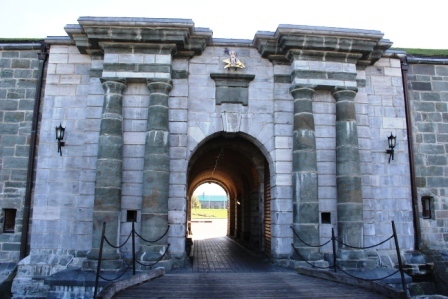 Pictures from La Citadel de Quebec. We found a parking space in a hotel’s parking garage in old town for $5 per 30 minutes. We walked around a little, did some browsing in shops, grabbed a coffee, hot chocolate, and cinnamon roll at the Starbucks in the Fairmont Le Chateau Frontenac hotel, and then returned to the car about 90 minutes later. We then drove to the airport area to get some additional waters, snacks, and other things for the last couple of days of our trip. We stopped at one of the 5 Walmarts in Quebec City and got most of what we wanted. We also stopped by a Zellers which looks almost exactly like a Target. We had seen these stores in many locations during our time in Canada and decided to see what they were like. Back to the hotel and we pulled into the entrance (across the street from the front of the hotel) to the underground garage and waited for the door to raise. We had been told the previous day on check-in that the front desk could see the entrance through a camera, that they would check their list, and allow their guests in. Don’t know if the person was busy at this time, but we waited almost 5 minutes for it to raise. There wasn’t any way we could signal from across the busy street. Went back to the room and relaxed for the rest of the afternoon. Around 6:30, we decided to eat at the hotel’s French restaurant, Le Saint-Victoire. We shared a game trio (rabbit, guinea, and duck) and shrimp appetizers, had chicken soup for the 2nd course, and shared a bread pudding and a creme brûlée for desert. My entree was a filet mignon with a baked potato and green beans. Wanda’s entree was a Shepherd’s Pie made of beef, corn, and potatoes. A lot of food, but for the most part it was excellent. The bread pudding was a little over-cooked. Coffee and tea finished it off. Also had a Rickard’s dark beer, for the first time, that I have found to be tasty. Back to the room for the rest of the night. We had planned on getting breakfast at the hotel again, but got up too late. Instead, we went to the car and drove to Aquarium du Quebec in time to see a 11:30 Walrus show which was outside with the temperature around 40 degrees, a light mist falling, and wind blowing 30+ miles per hour. We had gotten there in time to do little walking around their main exhibit building, but followed several school groups out when it was time for the show. Following the show, we returned to the building and bought some food and hot drinks for lunch. We finished going through the building in time to go to a 1 PM Harbor Seal show that was also outside. It seemed to be colder and the wind seemed to have picked up more for this second show. After it, we went back to the building to warm up and then left the aquarium. 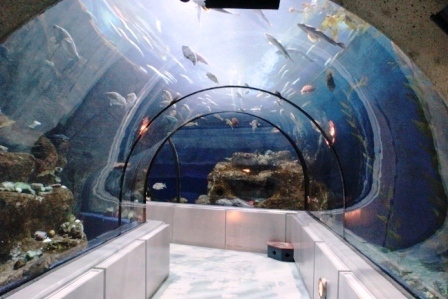 It is a nice small aquarium that would be more pleasant in warmer weather. Pictures from the Aquaruim du Quebec. Stopped by a Staples store (called Bureau En Gros) to pick up a box to pack the souvenirs in and mail home once we are in Vermont. We the drove to the “neue” area of Quebec City to visit the Choco Museum at a store called Erico’s. 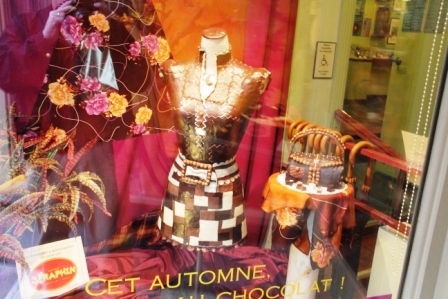 This is a chocolate store and you can watch through a small glass window the workers make the chocolate. Ended up buying a hot chocolate and some candy to bring home and to work. We then walked down the street browsing store windows before returning to the car and going back to the hotel. Pictures from Erico's Chocolate Museum and Shop. We ended up waiting about 5 minutes again for the garage door to be opened by the clerk at the Royal William hotel. Back to the room to rest some. Went to a Subway on the same block as the hotel. Quick meal and back to the hotel to finish up packing. We got up at 5:30AM , cleaned up, checked out, packed the car and left the hotel by 7:00 AM. We decided not to eat yet, but to drive some and get breakfast later. This was accomplished at an Information Center after we turned off of Canadian Highway 20 to Highway 55. There was a McDonald’s there and we grabbed a couple of breakfast sandwiches. 1. Where had we been? 2. How long had we been in Canada? 3. Where do we call home? 4. Where were we heading now? 5. Were we going somewhere before Manchester? 6. Did we have any meat products, fruit, …..? Had to stop and figure out again how to change the units being displayed on the speedometer and mileage from metrics. He then welcomed us back to the states and have a good trip home. On the way to the tour, we stopped at a post office in Stowe, Vermont to mail a box of souvenirs back to the house. I didn’t want to take all the glass mugs in the luggage, so had packed them well in the box. We made it to Ben & Jerry’s in time for the 1:15 PM tour with our guide being a young lady named Liza. We saw the customary historical documentary, with some comedy thrown in and then the factory floor from overview windows. They had already finished their production goals for the week and were finishing cleaning the two lines before leaving for the day. They run 24 hour operations for 5 days a week and finish when the goals are met. They only run one line at a time due to the size of the workforce. They also only run one flavor at a time, hen clean that line when they have enough of that flavor and start another flavor on the other line. There are 6 factories - three in the USA, one in Canada, one in the Netherlands, and one in Israel. They buy products only from organic farmers and are striving to only buy from Fair Trade partners (those who pay their workers fairly). Workers get to eat all the ice cream they want and also take home 3 pints a day that can be used for barter. At the end of the tour, we were given samples of Caramel Trio to eat. We then browsed the store, bought a few items, bought a chocolate milkshake, and looked at the cemetery of deceased flavors. Some vandalism had even occurred here in that a couple of markers were missing pieces. 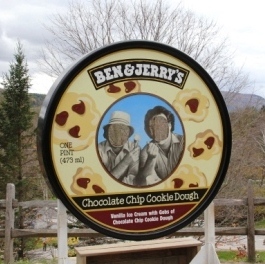 Pictures from the Ben & Jerry's Ice Cream Factory. Back on the road, we drove into New Hampshire and stopped to look at an old covered bridge in Contoocook. 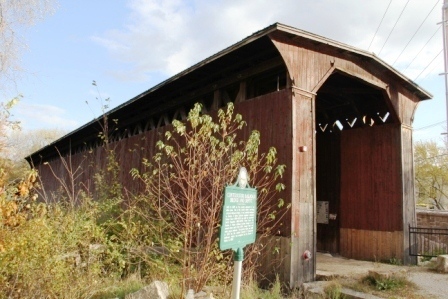 Pictures of the Contoocook Covered Bridge. Then on to Manchester, filled up the car with gas as we got there, and checked into the Comfort Inn Airport we had a room on points for. Pictures of the Comfort Inn Airport room. Supper was at a small local Italian restaurant named Luisa’s on River Road not far from the hotel. We both ordered chicken parmigiana with spaghetti, bread sticks, and mozzarella sticks. They brought us a lot of food - each got a very large dish of spaghetti with four pieces of chicken. We could have split one order and been full. Back to the hotel for the evening. Have to get up early for a 6:30 AM flight. We got up at 4 AM EST and checked out of the hotel by 4:45. Made it to the airport’s rental car drop-off by 5 AM. Since there wasn’t any attendants, we unpacked the car, locked it, and put the keys in a dropbox. I got through security pretty quickly, but they wanted to check Wanda’s backpack after scanning it. Think it was due to a tin of tea that she had bought for Courtney in Quebec City. Besides looking in the backpack, they did a swab test for explosive materials. This airport only has the old X-ray machines, not the full body scans. - Southwest Airlines flight 3106 from MHT to BWI leaving at 6:35 AM and arriving at 8:10 AM with boarding passes A22 / A23. - Southwest Airlines flight 2212 from BWI to HOU leaving at 9:20 AM EST and arriving at 1:20 PM CST with boarding passes A25 / A26. This one had a stop in Charlotte, South Carolina. The first flight was uneventful and we arrived about 5 minutes early. Upon arriving at BWI (Baltimore-Washington International), we went to our next gate area to wait. We both went individually to get some food at a nearby Subway. I got breakfast and ate it before the flight. Wanda got a sandwich to eat for lunch while on the airplane. Before the second flight, we started seeing Navy cadets start appearing and then a group of people with all the same t-shirts and carrying flags. Next a camera crew showed up at the gate we were scheduled to leave out of. One of the gate attendants got on the loudspeaker and announced that a group of WW II veterans were arriving on the flight from Louisville, Kentucky to visit the WW II museum and invited everyone in the gate area to help welcome them. The cadets and a few other military personnel, along with the people in the matching t-shirts all lined up waiting for the veterans to deplane. The next flight’s passengers grouped in behind the lines. Southwest deplaned everyone else first and then the next fifteen was full of everyone clapping as the veterans came off the plane. Some of them had to be in wheelchairs, but it wad obvious that quite a few of them insisted on getting out of their wheelchairs and walk before they left the gate’s ramp. Think there was about 25 of them in total. Most people found it funny. Scottie was on both legs of the second flight and both legs were full. We arrived in Houston around 1 PM; twenty minutes early. Not sure what happened, but the luggage arrived in the downstairs area about 1:45 after they announced several times that it was on the way, but they couldn’t tell us why it had been delayed. Our three pieces of checked baggage were in the first 10 pieces to finally show up. Took a taxi home from the airport, paid the taxi driver $27 with tip, and was swarmed by mosquitoes as we tried to get in the house. I spent the next five minutes trying to kill all of the ones that made it into the house with us and the luggage.